Rodney Dalzell has stepped aside following the incident. 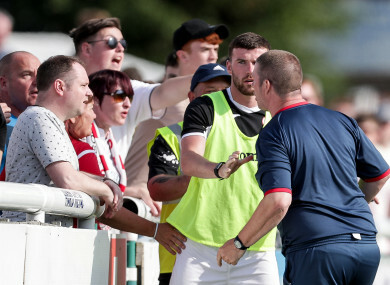 Sligo's goalkeeper coach Rodney Dalzell argues with supporters as Patrick McClean attempts to calm him. SLIGO ROVERS’ GOALKEEPING coach Rodney Dalzell has resigned following an altercation with some of the club’s supporters after their 2-1 loss to Bray Wanderers yesterday. Sligo are now just two points clear of the relegation zone and the controversy surrounding Dalzell has compounded their woes. A club statement read: “Sligo Rovers regret yesterday’s post-game exchange between a member of our backroom team and some supporters. “The exchange occurred when passions ran high in the aftermath of the full-time whistle of a disappointing day. We believe our staff care deeply about the club but on this occasion it was not construed in a fitting manner. “As a result, goalkeeping coach Rodney Dalzell offered his resignation this morning which the club accepted by mutual agreement. This is an admirable course of action taken by Rodney, and one we respect. “The level of support we receive as a club is extraordinary and we place huge value on it. Email “Sligo goalkeeping coach resigns following altercation with supporters”. Feedback on “Sligo goalkeeping coach resigns following altercation with supporters”.